This is our first week back to school after a long and relaxing spring break. We were able to take the kids to one of our favorite camping spots at the beach. We spent our days playing in the surf and sand, making sand castles and playing in the waves. We love to camp and visit state parks and enjoy our state’s natural beauty. However when we camp, we’re not exactly primitive camping. There’s a fully stocked travel trailer with a fancy little coffee maker, ice maker, fridge, a/c, down blankets, fluffy pillows and a large flat screen. We love to watch sports, even when we’re camping, so having a big T.V. in our travel trailer is perfect. We can make yummy grilled foods or easy treats like these flautas to eat while enjoying the big game. This flauta recipe is one of those super simple recipes I can make anytime. It’s so easy and great when we’re entertaining. I love to make these on game days because they take so little effort and everyone loves them. To make this recipe I start with Curly’s Sauceless Pulled Pork. It’s a delicious and flavorful ready to eat pulled pork that can be used in a variety of different recipes. You can find Curly’s Sauceless Pulled Pork in your grocer’s refrigerated meat case. To start this recipe, just heat Curly’s Sauceless Pulled Pork per package directions. Then combine it with some shredded Mexican blend cheese and mix well. Then add a little of this mixture to a small flour tortilla. Then just roll it up about the size of a cigar. And place on a greased cookie sheet. After you have rolled up all of the meat and cheese mixture, spray the tops of the flautas with some non-stick spray too. Then they are ready for the oven! THey cook at 400° for about 15 minutes, or until golden brown. To serve just add a little lettuce. Fresh cilantro is a nice touch too! And don’t forget some dipping sauces. We like to serve with guacamole, salsa and sour cream. Hot sauce is yummy too. 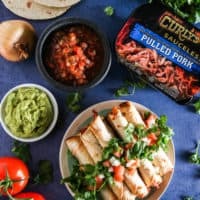 Curly’s is my favorite brand of pre-packaged BBQ and is such a versatile product to have on hand for simple recipes like this one. There are lots of different recipes you can make using Curly’s products. You can find Curly’s BBQ in your grocer’s refrigerated meat case. Be sure to pick some up on your next shopping trip! For a limited time, there will be a $1 OFF coupon available on Curly’s packages in-store. A quick and easy recipe for baked pulled pork flats the whole family will love. Heat oven to 400°. Heat Curly’s Sauceless Pulled Pork according to package directions. Add to a large bowl and add shredded cheese. Mix well. Spray a large cookie sheet with non-stick spray. Warm flour tortillas in microwave per package directions to make soft. 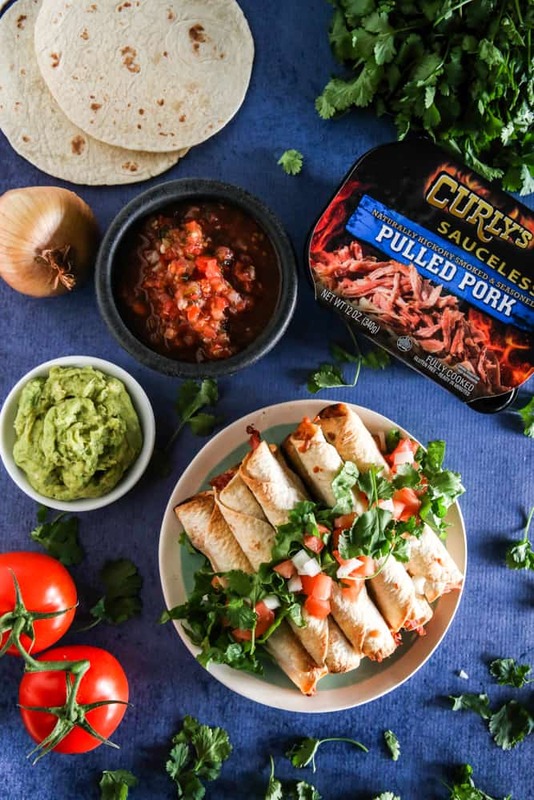 Add a little of the pork and shredded cheese mixture to tortillas and roll up as shown in photos above. Place seam side down on cookie sheet. Repeat until all flautas are made. Spray the tops of flautas with non-stick spray. Bake for 13 - 15 minutes, or until golden brown. Serve garnished with lettuce, tomato, onion and fresh cilantro. This post was sponsored by Curly’s. All thoughts and opinions 100% mine. Love how easy these flautas are to put together! Perfect for a busy weeknight with the kids!! Wow! These look amazing! Great for our next Mexican Feast!